Poliomyelitis, or polio, is a serious infectious disease that attacks muscle-controlling nerves and can eventually cause paralysis. Poliomyelitis, sometimes called infantile paralysis, is caused by one of three related viruses, and it primarily affects children. However, adults can also be infected. There is no drug that can cure the disease once a person has been infected. Poliomyelitis is infectious, meaning it is spread primarily through contact with someone who already has the disease. The virus enters the body through the mouth and then enters the bloodstream. Once in the central nervous system, it travels along nerve pathways. In severe cases, it reaches the spinal cord or the brain where it causes lesions (abnormal changes in the structure of body tissue). Symptoms usually begin to show one to three weeks after the virus is contracted. In some cases, the attack may be so mild that it goes unnoticed. The body quickly develops immunity and the virus is eliminated. A more severe attack gives rise to symptoms that resemble those of influenza (fever, sore throat, vomiting, diarrhea, stiff neck and back, and muscle pain). About two-thirds of people infected in such a way recover without suffering any paralysis. A serious attack occurs if the virus reaches the central nervous system. Muscle tissue weakens and paralysis develops. Usually the paralysis is only temporary, and about 50 percent of people infected recover without permanent disability. However, if any of the cells attacked by the virus are destroyed, they cannot be replaced and muscle function is permanently impaired. About 25 percent of people who recover after being seriously infected have severe permanent disability. Iron lung: Device developed in 1928 by Philip Drinker to maintain artificial respiration in a person over a long period of time. Sabin vaccine: Oral polio vaccine developed by Albert Sabin from weakened live polio viruses and introduced in 1961. Salk vaccine: Polio vaccine developed by Jonas Salk in the mid-1950s from dead polio viruses and given through injection. If the nerve cells of the brain are attacked (a condition known as bulbar poliomyelitis), the muscles controlling swallowing, heartbeat, and breathing are paralyzed. The result is death. Incidents of poliomyelitis can be traced back to ancient Egypt. The first recorded poliomyelitis epidemic (a rapidly spreading outbreak of a contagious disease) was in Sweden in 1881. From that time until the mid-1900s, there were regular epidemics throughout the world. To help those people infected with poliomyelitis whose respiratory (breathing) muscles had been paralyzed, American physiologist Philip Drinker (1893–1977) invented the Drinker tank respirator (commonly known as the iron lung) in 1928. It is a device to maintain artificial respiration in a person over a long period of time. 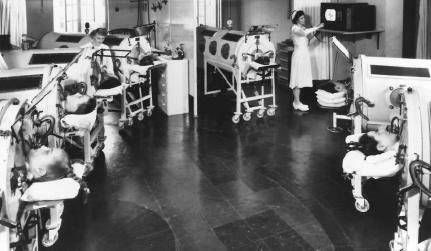 The iron lung is an airtight cylindrical steel drum that encloses the entire body, with only a patient's head exposed. Pumps connected to the device lower and raise air pressure within the drum, which contracts and expands a patient's chest walls (imitating the action of breathing). Many poliomyelitis patients were kept alive in such a manner, but it was not a cure for the disease. four injections with the killed-virus vaccine prompts the body's immune system to produce antibodies that will attack any future invading forms of the disease. In 1955, the vaccine was officially pronounced effective, potent, and safe in almost 90 percent of cases. The major defense the Salk vaccine provides against polio viruses is to prevent them from spreading from the digestive system to the nervous and respiratory systems. But it cannot prevent the viruses from entering the intestinal tract. In the late 1950s, Russian-born American virologist Albert Sabin (1906–1993) developed a vaccine that has proven to provide longer immunity against the disease than the Salk vaccine. The Sabin vaccine is composed of live (but weakened and harmless) poliomyelitis virus. After four years of worldwide tests, the vaccine became available to the public in 1961. The advantage of the Sabin vaccine is that it is given orally and offers protection with only a single dose. The vaccine goes straight to the intestinal tract and builds up immunity there as well as in other parts of the body. Both vaccines are effective against all forms of the poliomyelitis virus. Near the end of the twentieth century, health organizations reported that poliomyelitis was close to extinction in the Western Hemisphere.